Winemakers: Turtle Run’s Jim Pfeiffer, Ted Huber, and Jim Butler at last year’s event. Indiana’s Uplands wineries will host one of the state’s premier wine events Saturday at Oliver Winery’s Creekbend Vineyard. The fourth-annual Uncork the Uplands features nine Southern Indiana wineries located in the state’s only federally-designated AVA – or American Viticultural Area. The wineries will be pouring their wine with food pairings, vineyard tours, and a chance to get up close and personal with some of Indiana’s best winemakers. The wineries will start pouring at 4 p.m. and keep it flowing until 8 p.m. Creekbend Vineyard is located across Indiana 37 from Oliver Winery. The address is 7508 N. Woodall Road. Tickets are $50 per person. Creekbend Vineyard illustrates what Indiana can do with wine grapes. “Guests will have the opportunity to explore the Indiana Uplands’ unique terroir firsthand with guided tours of Oliver’s Creekbend Vineyard,” said Turtle Run Winery owner/winemaker Jim Pfeiffer. The Creekbend Vineyard covers 54 acres over rolling hills near Bloomington. More than 30,000 vines feature Indiana signature grapes like Traminette, Chambourcin, and Vignoles among others. Admission includes opportunites to taste local cuisine and enjoy music from Art Four Sale, a Nashville, Tn., based instrumental quartet. This post was mostly written as a release for the newspapers which carry my column. I promote this event, over some others, because I find these wineries consistently deliver Indiana’s best wines. The three gentlemen above, lead the pack in top quality Indiana wine, along with host Bill Oliver. 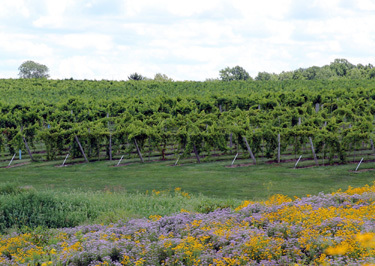 The Indiana Uplands Wine Trail is located within the Indiana Uplands American Viticulture Area, a federally recognized grape-growing region established in 2013. The trail wineries include Best Vineyards Winery of Elizabeth; Brown County Winery of Nashville; Butler Winery of Bloomington; ; French Lick Winery of West Baden Springs; Huber’s Orchard, Winery and Vineyards of Starlight; Oliver Winery of Bloomington; Turtle Run Winery of Corydon and Winzerwald Winery of Bristow. Howard Hewitt’s post on Uncork the Uplands.